Marichuy, Mexico’s indigenous candidate: "My goal goes beyond being president"
As young councilor Yamili Chan Dzu gives her speech, Marichuy’s eyes roam the small crowd. There’s only a little over a hundred people there. Unlike the mass meetings of the political parties, where trucks arrive full of people from all the neighboring communities to listen to the candidate in turn, this event of the Indigenous Council of Government has not been able to gather more than a handful of artists, reporters and some other clueless souls who heard what was happening and approached, perhaps moved by curiosity to see the small white cloth at the entrance of the Chan Santa Cruz Cultural Center that read: “This event is totally peaceful, for the people and of the people, unrelated to any political party”. 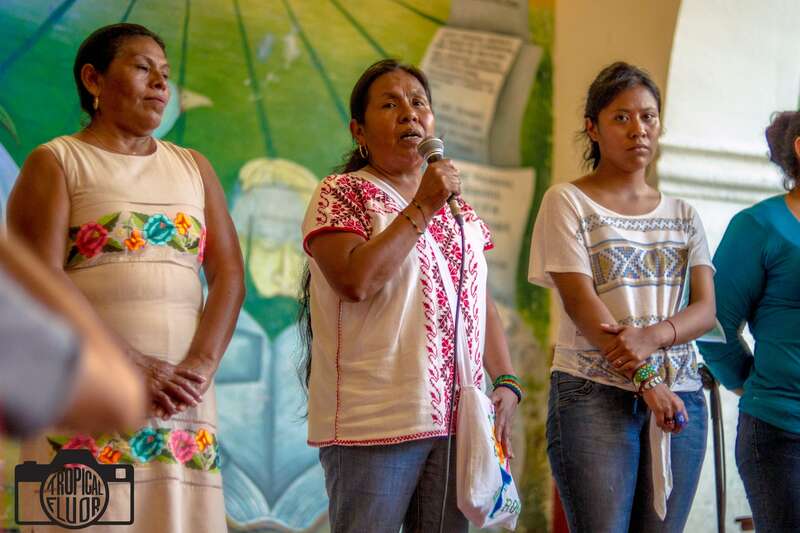 Although Quintana Roo is home to one of the largest indigenous populations among all the states in Mexico, it is the first time that the Indigenous Government Council has held a public event to collect signatures in the state and the outlook is not encouraging. At the time of this event, there were not even two months left before the Feb 19 deadline — and they had barely managed to gather 10% of the 1 million signatures necessary for her placement on the national ballot. That day in Felipe Carrillo Puerto, a population of more than 25 thousand inhabitants, only about 60 people signed. Despite the minimal returns, Marichuy showed her appreciation for the humble effort made by the small group of citizens of Carrillo Puerto and surrounding towns to organize an independent event without any support from the National Electoral Institute. Each peso invested in that event for printing informative material, transportation, lodging and meals came out of the pockets of the Councilors and the citizens of Carrillo Puerto and the surrounding area, who have shown solidarity with the cause, lending space, chairs, sound equipment and other items, while local artists contributed music and dancing to liven up the event. Therefore, it does not matter if there are many or if there are few present, they are people who believe in the project, and the objective has been fulfilled: that people organize themselves to achieve a common goal. The Council of Indigenous Government has agreed to carry out its electoral campaign without accepting money from the federal budget, although if she achieves her goal and is registered as an independent candidate, Marichuy will legally be entitled to a percentage of the 42.96 million pesos that the government will allocate in 2018 for the financing of candidates and independent parties. But they made the decision to refuse that funding, among many other reasons, because they want to show that when people organize and collaborate they can achieve whatever they want, without depending on government support. According to Councilman Francisco Ortiz, originally from Tepoztlán, Morelos, the CIG’s interest is not to win an election, but to call all citizens to organize themselves to transform the way politics is done in Mexico, and achieve change from below, regardless of what happens at the polls in 2018. “It’s not an electoral proposal, it’s a proposal for struggle” explains Ortiz. One of the things that characterize the electoral platform of María de Jesús Patricio, 54, an indigenous Nahua and a traditional doctor from Tuxpan, Jalisco, is her concern for protecting nature. Unlike most politicians, who speak little or nothing about the measures their governments will take to protect the environment, Marichuy focuses almost all of her speech on the need for all Mexicans to come together to defend forests, waters and life in general, in the face of the megaprojects that are devastating all the natural wealth of Mexico and all of America, and that with the recently approved Law of Biodiversity, the table is set to continue with the dispossession of protected areas. Marichuy’s followers are aware that entering the game of electoral politics is very dangerous. As Lizbeth Morán, another young councilor originally from Tuxpan, Jalisco, expressed during her speech, there is still a deep racism in Mexico and indigenous peoples continue to suffer from serious discrimination. For this reason, she insisted on the urgency that all Mexicans, in all the states of the Republic, join together to put an end to the problems that afflict the country, both in the cities and in the communities and villages. “Exile, disappearances, deaths and drug trafficking are not only in indigenous communities, but also the brothers and sisters of the city are suffering” stated Morán. However, this discrimination and the gap between the indigenous and “the people of the City” – the mestizos and non-indigenous Mexicans – is a factor that may not allow Marichuy to become president of Mexico. It is improbable that she will even reach the number of signatures needed to appear on the ballot. In order to obtain registration as an independent candidate, Marichuy needs to collect about one million signatures of Mexicans registered with the National Electoral Institute in at least 17 states of the Mexican Republic before February 19, 2018. Marichuy’s supporters are organizing signature collecting events all over the country. The only requirement to sign is to be a Mexican citizen and have a valid voter registration card; Through the Citizen Support INE application, registered CIG assistants take photographs of both sides of the credential and then capture the citizen’s electronic signature. It is a process that takes no more than five minutes, with a good internet connection. However, it is a system that is clearly leaving aside a large segment of the population: exactly the segment that includes most of the supporters of Marichuy. Throughout Mexico there are many indigenous communities that support the National Indigenous Congress, and they could collect thousands of signatures to obtain the registration of the CIG, but they are places that do not have access to the Internet or where none of its inhabitants have sophisticated devices such as tablets or smartphones. In many indigenous territories, there is not even cell phone coverage. Silvia Diaz, who has been supporting as a registered volunteer to collect signatures in Carrillo Puerto even points out that at the beginning of the process the application could only be installed on iPhones and iPads and that it was a problem because among all the auxiliaries in the region only one person counted with a device of this type. However, currently any citizen who wishes can download this application on their cell phone and register as an Auxiliary to support this collection of signatures. In theory, it is not necessary to pay for the large advertising campaigns being carried out by other candidates for the independent candidacy. If Marichuy’s proposal reaches more people who have access to networks and technology and take the time to register and capture their own signature and those of their acquaintances, if more mestizos are in solidarity with this indigenous movement, it may be easier for Marichuy to reach the number of signatures needed to be a candidate. “This proposal comes from indigenous peoples, but it is not just for us. We are defending life for all, not only for indigenous peoples” says Marichuy. Angélica Almazán is a Mexican singer and writer, and assistant editor of The Esperanza Project.